Throughout their reign of power, they bombed government buildings and train stations, killed police officers and political officials, and established the practice of “knee-capping.” Their most dramatic acts were the kidnappings of five-time former Italian Prime Minister Aldo Moro and NATO officer Brigadier General James Dozier. 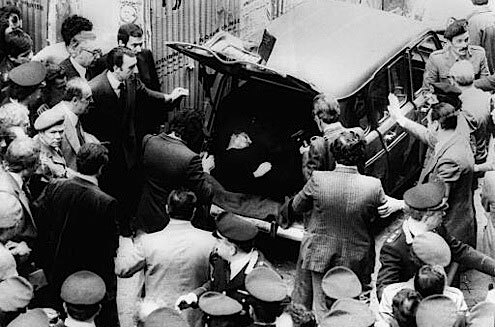 Moro, then the leader of the Christian Democrat party, was targeted due to his attempts to reach an agreement with the Communist party in what people called a “compromiso storico”– a historic compromise to bring about greater unity in the Italian legislature. He was kidnapped in 1978 on his way to a legislative meeting and held for 54 days in exchange for the release of 13 Red Brigade members. The Italian government refused to give in to their demands, and Moro was murdered on May 9. This caused a huge blow to the Red Brigades, who lost many supporters afterwards. In 1981, they kidnapped General Dozier in a demonstration of disapproval with Italy’s deepening ties with NATO. He was rescued after 42 days of imprisonment in a daring plan by Italian police. The Red Brigades succumbed soon after to concentrated police efforts and internal divisions in the group. While they faded into obscurity by 1990, new radical or terrorist groups in Italy still use their logo and name as a banner under which they can rally together and draw attention. Robert Barbour served as the Political Officer in Rome from 1967-1972, and was interviewed in 1992; Philip W. Pillsbury, Jr., the Chief of U.S. Information Service (USIS) office in Turin from 1976-1980, was interviewed in 1994; Walter J. Silva, the Political-Military Affairs officer in Rome from 1974-1978 and in Naples from 1981-1985, was interviewed in 1995; Lacy A. Wright Jr., the Deputy Consul General in Milan from 1976-1978, was interviewed in 1998; J. Phillip McLean, the Deputy Principal Officer in Milan from 1980-1983. was interviewed beginning in 1999. All the interviews were conducted by Charles Stuart Kennedy. John Hurd Willett, a Political Officer in Rome from 1981-1984, was interviewed by Richard Jackson beginning in 1998. Charles K. Johnson, the Deputy Principle Officer in Milan from 1965-1968 and the Consul General of Milan from 1979-1986, was interviewed by Jay P. Moffat in 2000. Go here to read about the string of terrorist incidents in Paris in the 1980s, Germany’s Red Army Faction, and the 17 November group in Greece. Read about the Mafiosi next door and other Moments on terrorism. JOHNSON: In 1969, [the radical] movement infected the Italian students. This led to a certain amount of political instability, which combined with nationwide strikes over contract renewals gave the appearance of crisis, even though the situation was less than critical. So the students were first. Then you began to see the beginnings of what the Italians call “contestazione.” What that really means — it doesn’t translate very well — is something like political confrontation. The theory behind this was hatched among a group of sociology professors at Catholic faculties of several universities in the North. Trento was one of the universities that gave birth to these theories. There were others in Padua. This was the beginning of the Red Brigade movement. People didn’t know exactly what to call them at this stage so sometimes they were called “Maoists.” It was the beginning of a manifestation which was hatched in ‘69. I came back to Italy in 1979. We were still dealing rather dramatically, in some ways, with the Red Brigade. BARBOUR: The most serious events, with enormous implications for the following years, were the beginnings of extreme left radicalism. I remember that one day about noon I was going to the Foreign Ministry in an Embassy car and we drove through a park, I forget its name, and suddenly we were surrounded by students and police. There was a big riot going on; we were not bothered as we were on the fringes. You could flag that as the beginning of the far left turmoil in Italian politics which went on for some years, and indeed the Red Brigades and others soon followed. 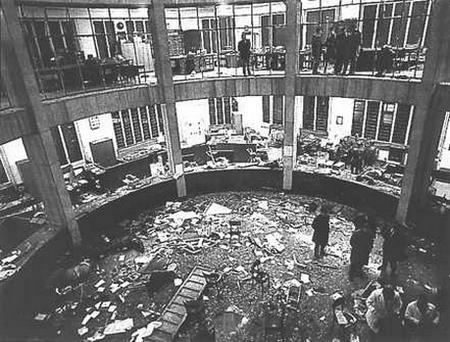 That December, 1968 I guess, was the Milan bombings and the Banca Nazionale dell’Agricoltura [National Bank for Agriculture] bombing, which was just around the corner from the Embassy. One evening about six o’clock a big bang shook the building, I walked over to see what was going on and somebody said the boiler had blown up. It was not that at all, it was a bomb. That was the episode and the beginning of a situation that become much worse in the ensuing two or three years. Q: Were we getting any reporting on the development of these extreme left-wing groups? BARBOUR: Not internally, nobody was. They were quite closed at the beginning. I think our estimate of them at the time was correct — unpredictable and dangerous, likely to grow. The Italian reaction at that time was somewhat confused; this was at the early stages, before the Italians got into them through their own drug addicts which really broke the backbone some years later. It was a difficult period. Q: Did we have much of a feel for what was going on in the universities at that time? BARBOUR: The Italian universities at that time were to a large degree written off by us as educational institutions. They were hotbeds of political extremism, the students were students in name only, their degrees were not worth anything. PILLSBURY:.The Red Brigades which were founded by members of middle to upper middle class families in the north, in Milan and Turin. At the time when we arrived they were using methods that were brutal but not fatal. I remember when I first got there, I heard the word “aginocchiare” which means to kneecap somebody. At some point shortly thereafter, they raised their sights and killed a journalist of La Stampa [major Italian daily newspaper from Turin], but they said: “We’ve raised our guns to eye level, and we’re now going to …” So the threat was definitely increased and the atmosphere was one of fear and uncertainty. The Italian government more and more was being held hostage to the threats of these urban terrorists, a very small group but very effectively organized. They were aided and abetted by groups of the extreme left. Even the Communist Party itself disavowed themselves from them. So it was not the atmosphere that one would hope of the stereotype of the fun-loving Italians, and good food and all that. There was that, but it was a very dangerous and unpleasant situation. Our cars were armed. Even my little Fiat office car was taken to Rome and had stuff put in. 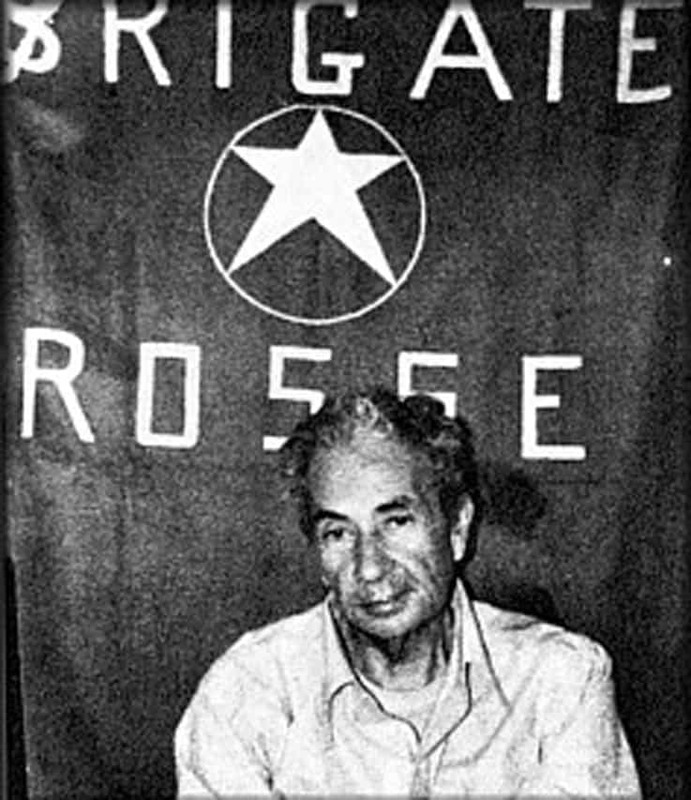 I think that the thing that impressed me the most was actually a very positive thing about Italy, was the kidnapping and eventual assassination of [Christian Democrat party leader and former Prime Minister] Aldo Moro, which was an effort on the part of the Red Brigades to bring the Italian government to its knees and to turn to fascist state control methods. Do away with civil liberties in order to get at this problem of terrorism and to the great credit of the Italian government, they didn’t do it. They went about it without destroying, taking away the civil liberties and in effect finally got judges and juries not to kowtow to the threats of local Red Brigades and to carry out the judging the members of the Red Brigade, to put them away. A very courageous aspect. SILVA: From the Embassy’s point of view there was a serious threat from the terrorists, the Red Brigades, as well as the Camorra. There was one disturbing incident; we were in a car as a part of a cortege going to church along the waterfront, a church near the Royal Palace. There were at least a 100 cars lined up, filled with “notabile“, and a Naples kind of traffic jam ensued. We were going to a church service for a Member of Parliament who had been killed by terrorists. A couple of guys went by on a scooter two or three cars ahead of us, fired through the window and killed the man inside. It was another deputy. And they got away. It was hard to imagine how in that traffic jam. There were thousands of people, cars, police, everywhere. But I suppose the scooter made it easier. 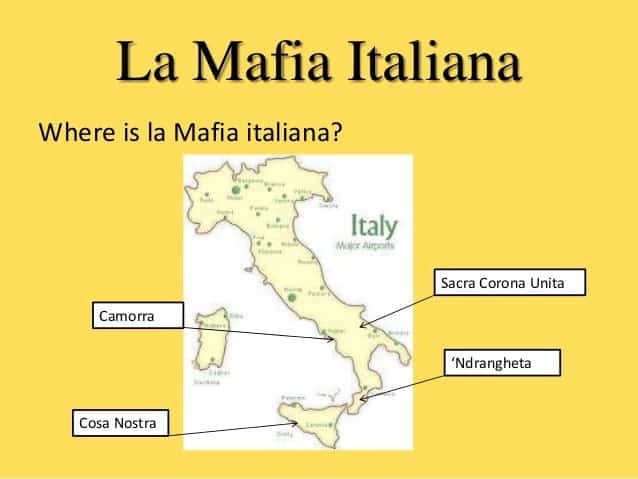 Not only did they make the getaway from the original crime, but they got out of Naples, according to the local press because they were smuggled out by the Camorra. There was never any doubt that that is what happened. They had made a deal. The Camorra helped them out in exchange for something, and the something was weapons. The Camorra thereafter turned up with Uzis and other exotic guns that theoretically they got from the terrorists. At least that’s what the Agency [CIA] and the FBI thought. It was an uncomfortable period…. That’s when they started providing guards for me…. The Agency turned up the hit list for the people in the South, and number one on the hit list was Admiral Bill Crowe, who was the NATO commander in Naples and number two was me. Obviously neither of us was hit, but as a result I got guards from the local police. It was all right, but kind of a pain. It was expensive. When I traveled and I had another car with three cops in it and got to a town or a city like Taranto and they provided protection, I would end up buying lunch for 10 people. It was very expensive, and I didn’t get reimbursed. But on the weekends [my wife] Mary and I would still sneak out. We’d either just walk out the back door and walk up town or take the funiculars up to the museums, or we’d go down to the garage, get in our car, and drive out and go where we wanted to go out of town. WRIGHT: These were dramatic days for the Italians because of the Red Brigades. There was a real reign of terror going on, which, thankfully, did not directly touch Americans — at least not until General Dozier was kidnapped a couple of years later—but which very much had Italians at their wit’s end, I would say. 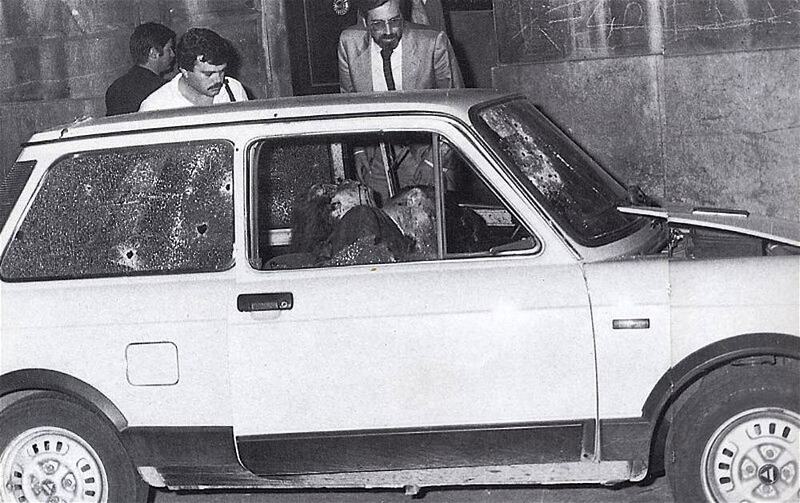 People that we knew, a journalist, for example, from the Corriere della Sera [Italian newspaper] was eventually killed, a year or so after I left Milan. A couple of people that I knew had their kneecaps shot. People who were wealthy lived in special terror, because they were worried about being kidnapped for ransom, as a number of them were. I remember once that Tom Fina [the Consul General in Milan] went to a dinner at the apartment of someone wealthy in Milan and at one point there was a telephone call for the host, and he came back into the room and he informed everyone that someone whom they all knew had been kidnapped. And it became clear to Fina that this was a subject of constant preoccupation for these people. He turned to the lady on his left and he said, “How many people do you know personally who have been kidnapped?” And she ticked off four or five. And he did the same thing to the lady on his right. And I can remember going out to the home outside of Milan of Silvio Berlusconi, who later became the Italian Prime Minister — even then extremely wealthy. And he lived in a French Tudor villa outside of Milan totally surrounded by guards. In fact, either he said this or I thought it, he had practically a Sicilian village living in his courtyard, armed. He told me that he didn’t send his children to school. He had tutors brought in to teach them. So, anyway, that was the climate in Italy at that time from a political point of view. And then this was all capped by the kidnapping of Aldo Moro, who, as you remember, was killed by the Red Brigades, and his body was found in the trunk of a car in downtown Rome. And I remember vividly when that occurred because the American Ambassador at that time, Richard Gardiner, was visiting Milan, and we were in a restaurant having lunch with a politician named [Giovanni] Spadolini. Spadolini later himself became Prime Minister of Italy. He was not at that point even a minister. And we were at Savini, which is a very nice restaurant, an old and classical restaurant in the Galleria near the Duomo in downtown Milan. And our group was on one side of the table and Spadolini’s on the other. Our group were three people, I believe, Gardiner, Tom Fina and myself, and during the lunch, I was called out by a telephone call from the consulate. And I was told by my secretary that the radio had just announced that Moro’s body had been found. No one, of course, up until that point, knew that he had been killed, until his body was found. And so I went back to the table, and I went over to Gardiner and stood next to him and whispered this to him, and he did not want to call this across the table to Spadolini, and he asked me to walk around the table and inform Spadolini, which I did. So these were dramatic times in Italy. The [Red Brigades] were a group of people who had links with other revolutionary kinds of groups in other parts of the world, in the Middle East, in Germany. …Many Italians refuse to believe that this was a home-grown group of people. Many Italians seriously would tell you that no Italian would do something like this. At least, not unless he was totally influenced by somebody else, so it was hard for Italians themselves to believe that people could get so riled up over a kind of revolutionary cause to impel them to engage in this kind of violence. I might also say that the Italians eventually decimated the Red Brigades, and I think this is something we often fail to remember about the Italians. Sometimes we don’t take the Italians as seriously as we ought to. Sometimes we forget that they have been tremendous allies of ours, both in the political-military arena, when they were the people in the 1970’s who installed the missiles that we wanted them to when no one else would, but also in this instance, where, you know, everybody preaches that, “We’re not going to deal with terrorists — we’re not going to negotiate with them.” But most of us break that rule when the crunch comes. It needs to be pointed out that when the crunch came for the Italians, when their own Prime Minister was in the hands of the Red Brigades, a man whose party was in power, was totally part of the political establishment, whose wife was calling out every day to implore the government to relax its policy and deal with these people, the Italian government held absolutely firm …and then, later, went out and totally mopped up the Red Brigades. That calls for real backbone of a national nature, and they did it. [Dozier] did something he’d been warned against: opening the front door without first ascertaining who was there. The Red Brigades immediately trussed him up and trundled him away. The U.S. government tried everything to find him, working closely with the Italians. Our Political Section was turned into a communications center, our offices taken over by Special Forces people who came in with all sorts of sophisticated equipment. At one point a clairvoyant arrived with a message something like, “He is in a farmhouse on a hill in Tuscany with three windows facing south. The third window is open.” Carabinieri immediately fanned out across the hills of Tuscany looking for a site that matched this description. Of course they found nothing. 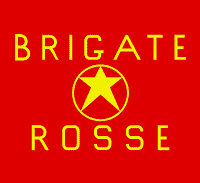 The Brigate Rosse — a nasty collection of people… Their theory was, “We’ll make things so bad they’ll have to impose a police state. The people will resent this and bring down the government.” What the French call “la politique du pire:” make things as bad as you can because then, from our point of view, they can only get better. The Italians are a resilient people and they weathered this storm, but it was a rough period. One American with an aid organization was killed…They came up behind him in his so-called bulletproof car and fired machine guns at the rear window until it gave way under the impact. McLEAN: What was interesting about the Dozier thing was the degree to which, once Dozier was released–and they found him. Contrary to some of the popular things written, they found him by a series of plea bargains, probably some pretty heavy questioning, but I had no evidence that torture was being used, but they did have plea bargaining in which they were bargaining with people until they got to the people who were pointing out where Dozier was. But in the subsequent months, year, the Red Brigades came apart. I remember Chief Adigos, telling me that one of the most awesome things was they were coming apart at the top. Each cell was breaking by its leader. The leader would break, and he would then accuse everyone else in that cell, and down and down it would go. It was a very impressive unrolling of what was going on…. In that period one of my contact was General [Carlo Alberto] Dalla Chiesa, who was the head of the Carabinieri, and I used to take people by to see him. One of the things he said to me one time when I brought Ambassador [Maxwell] Rabb in to see him, he emphasized to me the need of still trying to be normal in the face of all these things, and he was talking specifically about the Red Brigade. He would get in his car on a Saturday and go with a miniature Fiat and drive the streets, and people would recognize him, and he felt that was very necessary to give a sense of normality. He was then transferred to Sicily, to Palermo, to take on the criminal organizations. …What happened was he was going down to the kiosk to read the newspaper one morning, he was assassinated. His wife, of course, died, his young wife died with him, and we had the task of consoling her father. Her father was always coming in and somehow trying to get meaning out of all this by learning what the rest of the world was reporting.